The Great North Air Ambulance was our adopted charity for 2011, and to receive the cheque for £1000, Mr. Robert Colgrave kindly came along to thank the choir for this much needed donation to help keep this fine machine in the air. 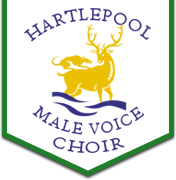 HMVC were invited to sing at Matty Daley’s 90th birthday party, held at the Supporters’ Club on the 15th July. The reason being that Matty has, and still is, a very big friend and supporter of HMVC. The place was packed out !! Do you think he looks 90? “Oh what a night!” HMVC will remember this night for all the right reasons. The memories of this concert will last a lifetime. Every person present saw Russell and HMVC deliver a superb performance .